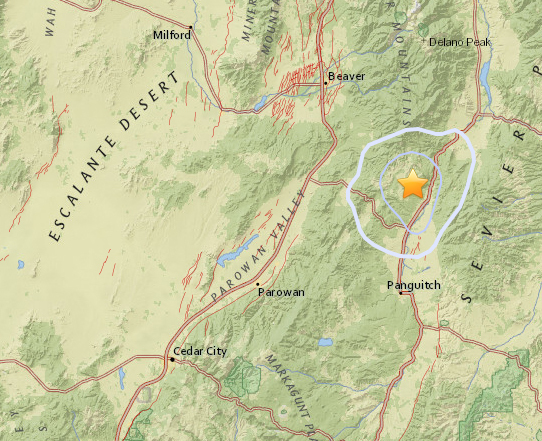 ST. GEORGE — A minor earthquake was reported Wednesday morning in Southern Utah. A University of Utah seismograph station recorded the 3.1 earthquake approximately 16 miles north-northeast of Panguitch around 7:21 a.m., according the U.S. Geological Survey. The USGS categorizes 3.0 magnitude quake as producing “weak” shaking and not likely to result in any damage. No shaking or damage in the area of the earthquake was reported by the public, according the Garfield County Sheriff’s Office. These minor earthquakes are fairly common across Utah and largely go unnoticed. According to the USGS website, Southern Utah falls in the Intermountain seismic belt, a “prominent north-south-trending zone of recorded seismicity in the Intermountain west.” The largest earthquake in the Southern Utah zone was a 6.5 magnitude quake in Richfield in 1901. More regionally, St. George has seen the strongest one with the 1992 5.9 magnitude quake. If you are indoors: Stay there. Get under a desk or table and hang on to it (drop, cover and hold on) or move into a hallway or against an inside wall. Stay clear of windows, fireplaces and heavy furniture or appliances. Get out of the kitchen, which is a dangerous place (things can fall on you). Don’t run downstairs or rush outside while the building is shaking or while there is a danger of falling and hurting yourself or being hit by falling glass or debris. If you’re outside: Get into the open, away from buildings, power lines, chimneys and anything else that might fall on you. If you are driving: Stop carefully. Move your car as far out of traffic as possible. Do not stop on or under a bridge or overpass or under trees, light posts, power lines or signs. Stay inside your car until the shaking stops. When you resume driving, watch for breaks in the pavement, fallen rocks and bumps in the road at bridge approaches. If you are in a mountainous area: Watch out for falling rocks, landslides, trees and other debris that could be loosened by quakes. Mike Pee, I’m sure you were there. How bad was the quake. Tell us about it. Paulley wanna cracker? Seriously? Went all-out coming up with that name, huh? Polly, don’t worry, Mike P spent alot more time coming up with “Mike P” than you did. Seriously? Sure wish he’d tell us harrowing stories about surviving California earthquakes. It would be riveting to hear his first hand witness account. I am on the EDge waiting to hear some! 42214. At least I have the … to use my real name. And, I only use one. I don’t hide behind other names & numbers so I can be a troll on here just to make fun of others. Could you PLEASE grow up? Ms 42214 and all versions of “Polly” . California earthquakes are a very well known fact. You may want to google them yourself before calling those fake too. I believe many comedians have done bits on them , possibly Ron White has also, as I know that’s whom you’ve referenced before as a source for your news. It was 1987. The Whittier earthquake. Thd day started like every other school day. My mom was as already at work and I grungeonly wake up, turn on the radio to KROQ 106.7 and get ready for school. I was walking drown the hall, all of a sudden the floor lifts up and rolls. It was from one side to the other. I grab on to the door jam, scared, waiting for the end. The rolling stops. I call my mom at work. I’m in a panic. I’m scared. She says, go to school. The end. Ladybugavanger, Yeah, I remember the Whittier quake well. I remember KROQ too ! Shadoe Stevens worked there a couple times, wonder what happened to him. We had KLOS and KMET as well. Do you remember the little low wattage rock station out in Orange county, KNAC ? Couldn’t get good reception outside of O.C. but it was pretty famous locally.